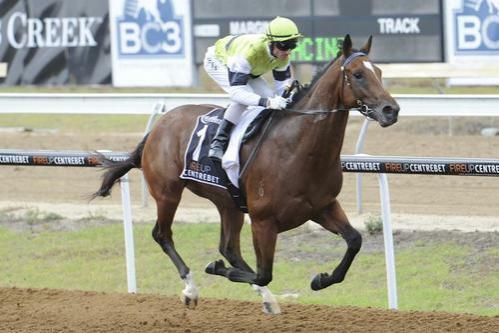 A great win by the Delbridge Racing syndicated 2-y-old, Great De Here, at Geelong today, 26th April 2013, winning over 1000 metres in the time of 58.8 seconds. Having his first start, Great De Here jumped well but with the quick early pace Melbourne Cup winning jockey, Glen Boss, settled him at the rear of the small field. He was never too far from the leaders and made his move rounding the turn. He was never really under pressure to reel them in and win under hands and heels riding by 3.5 lengths. It was a strong win. There was a big crowd of Delbridge Racing owners on-course and they packed the winner’s circle after the race to welcome the Mark Kavanagh trained Great De Here back to scale.